PA28α and PA28β expression in hearts of mice with CR-PA28αOE. 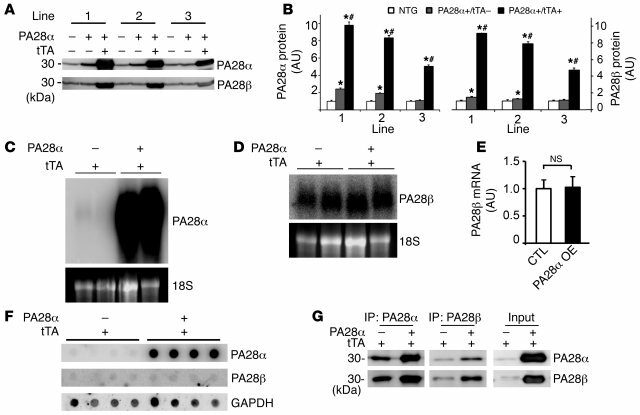 (A) 3 Tg responder lines carrying Tg PA28α were crossbred with the tTA Tg mice. No Dox was given to the breeding pairs or pups. Western blot analyses of 2-month-old mouse heart samples show that CR-PA28αOE resulted in a proportional increase of PA28β protein in the PA28α/tTA double-Tg mice. (B) Quantitative densitometry analyses of PA28α and PA28β protein levels. n = 3, *P < 0.001 vs. non-Tg (NTG); #P < 0.001 vs. tTA single-Tg. (C and D) Representative Northern blot analyses for PA28α (C) and PA28β (D). (E) Quantitative analysis of PA28β mRNA levels. CTL, control. n = 4. (F) RNA dot blot analyses of PA28α and PA28β transcript levels. GAPDH and ribosome 18S RNA served as loading controls. (G) Reciprocal IP with PA28α and PA28β antibodies showed increased PA28α-associated PA28β and PA28β-associated PA28α in myocardium with PA28αOE.